I dedicated this week to working on myself. There are two big milestones coming up for me next month, and I want to make sure my mindset upleveled to meet my objectives, and actions. For February (next month) I decided I will be hosting a live Facebook group training, and a live webinar about Pinterest marketing for brands. I know it sounds a bit mundane, but up until this month (January 2019) I was very scared of being on video, and just one month later I am about to do live videos. 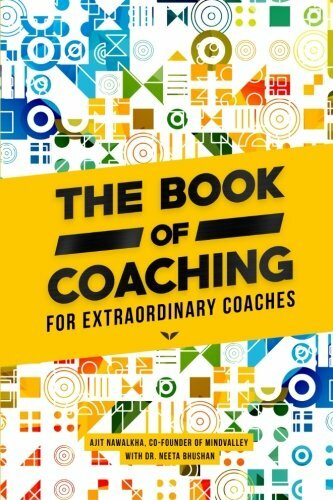 I decided to read Ajit Nawalkha’s Book of Coaching hoping to learn about new mindset exercises that will help me in my own coaching practice. I learned that and so much more. In fact, this book has helped me up-level my confidence, and mindset too, not just my methodology, and while it’s a good read for the beginner coach, I would recommend it for entrepreneurs as well. To be a great coach, you need to constantly do the mindset work to up-level as a human being too. To be a great entrepreneur, you need to constantly do the mindset work to up-level your life. The book touches base with mindset limitations that entrepreneurs face too, especially in the early stages of their business journey. There are chapters and exercises to help you get unstuck, crush fear, stop comparing yourself to others, redefine your goals boost your motivation, and self-confidence. Your growth as an individual decides the growth of your business. Your power to get over yourself ignites the customer to create results. Deal with your fears to help people achieve the change they want. Create a morning routine to start your day in a high-peak state and nourish your mind, emotions, brain, body, and spirit. This works very well for me. Redefine your goals, and what success means to you. It’s not about the goal, but growing to become the person who can accomplish the goal. Identify your major needs and figure out how you react in relation to your need for love, belonging, worthiness, enoughness, and validation. I recommend getting both the audiobook and the ebook or hard copy. The audiobook is easy to listen while traveling, while the ebook or hard copy will help you assimilate the information in-depth. Or at least that’s how it was for me. Learn more at Evercoach, The Book of Coaching or buy the book on Amazon. I love the first part of the year! It’s a great time to set up goals, and get more and more clear about what I will create in the upcoming months. So I jumped to the occasion to join hundreds of women all over the world, in a five-day challenge with Anna Runyan, from Classy Career Girl, aimed to help female entrepreneurs figure out five essential aspects of their business. This was a very useful journaling exercise that helped me become a lot more aware of what motivates me as an entrepreneur, more clear on who my ideal client is, of how important it is to be visible, and finally, of how I can achieve my financial goals. You can sign up for her business planning challenge here. I must confess… I don’t really enjoy using Instagram in my marketing, because I don’t have the time to create daily content, publish stories, follow, and unfollow, and all that jazz. However, I do look for ways to make it easier for me to use this channel, and one of the best Instagram resources I have found lately is Amanda Bucci’s course on developing your personal brand using Instagram to market yourself. The course is available with MentorBox’s Entrepreneur Academy. Btw she is also running a branded course of her own on Instagram marketing. It’s called Insta Impact. I haven’t had a chance to take the course, but it’s on my list. Need help with your visibility strategy? I have been working in digital marketing for almost a decade and more than half of that, I was in a marketing manager role. I can help you figure out new visibility opportunities for your business or personal brand, identify mindset limitations that keep you stuck and silent (and ways to fix them), as well as assessing your existent visibility channels and optimizing them to better serve your objectives. Reach out to me here to book a free visibility coaching call.